In my opinion, a truly great First Bull Run battlefield touring guide hasn't been published yet, but there are rumblings about for both Manassas battles. The Spruill's, through the University of Tennessee Press sponsored series, have a 2nd Manassas volume coming out soon, and Ethan Rafuse's Manassas: A Battlefield Guide (which presumably will cover both battles) is set for a spring release. Rafuse's book will be the newest entry from Nebraska's infrequently updated series, which has proved to be my favorite over the years. The 1863 Knoxville Campaign battle at Campbell's Station has been briefly described in overview works such as Digby Gordon Seymour's classic Divided Loyalties and Earl Hess's more recent The Knoxville Campaign, but The Battle of Campbell's Station: 16 November 1863 by Gerald Augustus is the first (at least that I am aware of) book length account. I haven't read the sample pages, but it looks like something worth investigating. 1. Ships of the Civil War 1861-1865: An Illustrated Guide to the Fighting Vessels of the Union and the Confederacy by Kevin J. Dougherty (Amber Books, 2013). An illustrated guide to 120 Civil War vessels of all types, two facing pages for each -- short history and specifications on the left and full-color, side-view artwork (which is good quality) on the right. 2. 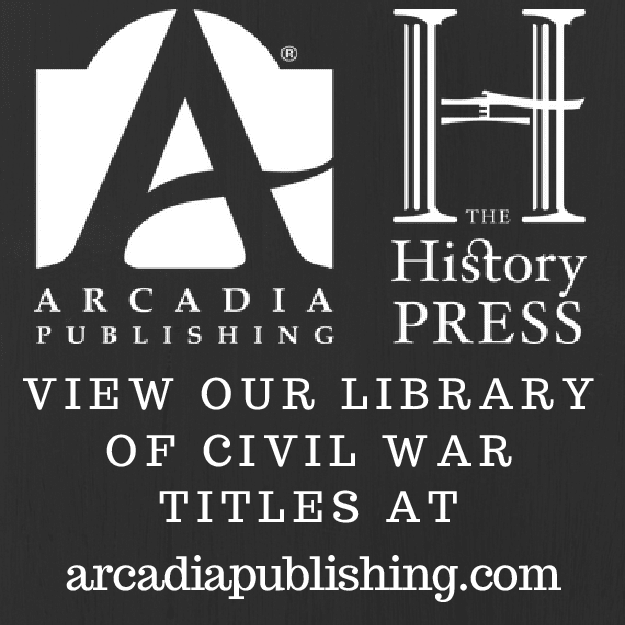 Illinois's War: The Civil War in Documents edited by Mark Hubbard (Ohio Univ Pr, 2013). The latest volume from OUP's Civil War in the Great Interior series. Editor Mark Hubbard has "has compiled a rich collection of letters, editorials, speeches, organizational records, diaries, and memoirs from farmers and workers, men and women, free blacks and runaway slaves, native-born and foreign-born, common soldiers and decorated generals, state and nationally recognized political leaders." I found the Kansas and Missouri volumes to be worthwhile additions to my collection. 3. Tell It With Pride: The 54th Massachusetts Regiment and Augustus Saint-Gaudens' Shaw Memorial by Sarah Greenough and Nancy K. Anderson (Yale Univ Pr, 2013). "Tell It With Pride explores the enduring significance of this beloved monument. Original daguerreotypes, carte-de-visite portraits, and a full listing of the regiment’s members, along with vintage and contemporary artworks by Matthew Brady, Lewis Hine, and Carrie Mae Weems tell the story of the legacy of the Battle of Fort Wagner and the role of photography in memorializing the regiment then and now." Hambrecht & Reimer, eds. 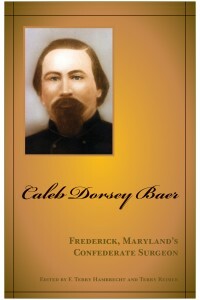 : "CALEB DORSEY BAER: Frederick, Maryland’s Confederate Surgeon"
Doctor Caleb Dorsey Baer, a native Marylander and 1848 graduate of Jefferson Medical College, moved to Dover, Missouri with his young wife sometime between 1852-55. In Lafayette County, Baer did double duty as Justice of the Peace and practicing physician. When a clash with the federal government seemed imminent, he joined the Missouri State Guard, a move unpopular with his Unionist family back east. With the commencement of hostilities, Baer was appointed regimental surgeon with two different commands and he also helped administer a military hospital in Carthage. When the pro-secessionist Missouri state military apparatus was scaled down, Baer joined the Confederate army. He was Staff Surgeon attached to the 9th Battalion Missouri (Pindall's) Sharpshooters, regimental surgeon with the 9th Missouri Infantry of Mosby Monroe Parsons's brigade, and later occupied a string of other divisional and brigade level postings until disease took his life on August 30, 1863. Like many Civil War diarists, Dr. Baer frequently comments on matters far outside his own sphere of duties. While he certainly does in many places mention his medical department responsibilities and health problems, Baer devotes greater space to military events, personalities, and places encountered while on the march. He writes some informative passages about the Battle of Wilson's Creek and the Lexington siege, but his discussions of the battles of Carthage, Helena (Ark. ), and Dry Wood Creek should draw special attention. Baer's accounts of his medical role at Carthage (and accompanying hand drawn maps of the locations of his field dressing stations) and Helena add a new dimension to the source information available for those battles, while his description of the Dry Wood Creek fight is more detailed than those found in most published histories. Some of the most extensive and vividly written passages [the one relating his observations of the crossing of the Boston Mountains was particularly memorable] document a long journey, accompanied by General Parsons, to Memphis. However, upon arrival, Baer seemed almost to have been forgotten by his superiors and no explanation of the mission's original purpose is offered. The whole episode is rather indicative of chaotic organization of the Confederacy's Trans-Mississippi war effort, especially early on. Baer's written opinions expose many of the provincial qualities that marred relations between Trans-Mississippi allies. He expresses nothing but contempt for Confederate General Benjamin McCulloch (a sentiment returned in spades by the Texan, who never reserved a kind word for Missouri state forces) and high praise for MSG commander Sterling Price. Baer also has little positive to say about Arkansas forces, who fought side by side with Missouri state forces on several occasions, accusing them of not possessing the same spirit and fighting qualities of their friends to the north. He also has a low opinion of the patriotism of Memphis's civilian population, believing them to elevate crass money concerns above all thoughts of the welfare of the Confederacy. In one of his rare moments of directing venom toward a fellow Missourian, the doctor labels General John S. Marmaduke a coward, intimating that it was a widely shared opinion*. The original Baer diary, with its many missing pages and drawings (all of which are noted in the book), was in rough physical shape as well before been stabilized and preserved by the archive specialists at the National Museum of Civil War Medicine. For this publication, editors F. Terry Hambrecht and Terry Reimer have transcribed the source writing as closely as possible, with spelling corrections in brackets, and have reproduced good scans of the two surviving map sketches. Rather than scholarly annotation, the footnotes mainly consist of providing the full names of those mentioned only by last name in the text. Sidebar micro-biographies and event descriptions are also scattered about. The Baer diary's informative qualities largely outstrip those of the average published Civil War primary source, making Caleb Dorsey Baer: Frederick, Maryland’s Confederate Surgeon an important new tool for those researching Confederate Arkansas and Missouri [though one wishes the title, which strongly implies eastern theater related subject matter, better represented the geographical focus of the content]. Additionally, the publication of Missouri State Guard material of any kind is very rare, and this book constitutes a notable contribution to that body of literature. Highly recommended. * - Marmaduke had many faults as a general, but this is the first reference to actual cowardice that I've encountered anywhere, leading me to speculate its source to be some sort of personal animus. More on "Stuart's Finest Hour"
John Fox, the author of a newly released book length history of JEB Stuart's famous 1862 ride around the Army of the Potomac on the Virginia Peninsula, has chimed in with some details. "Stuart's Finest Hour: The Ride Around McClellan, June 1862" is just off the printing press. The national release was held last Tuesday evening at Hanover Tavern which figured prominently in the raid. There was a big crowd to hear my presentation and to celebrate the new book. In the 20 years since the good Ed Bearrs' article  and the excellent Horace Mewborn article in B&G  many more primary accounts have been made available. I have used these new sources to reveal the chaos and confusion this raid created behind Union lines for both the Federal leadership and the lowly private on picket and vidette duty. George Skoch made 7 new maps to include the only map ever-made to show the cavalry fight at Linney's Corner where Captain William Latane's 9th Va Cavalry squadron clashed with three companies from the 5th US Cavalry under Captain William Royall. The book also details multiple controversies involving McClellan, Stuart, Philip St. George Cooke and how this significant expedition altered the tactical and strategic situation in 1862 Virginia. The table of contents is now available for The Vicksburg Campaign, March 29-May 18, 1863 , the next Woodworth & Grear edited book in SIUP's Civil War Campaigns in the Heartland essay collection series. This is the first of 5(!) planned Vicksburg volumes. Collins: "THE ARMY OF THE POTOMAC: Order of Battle, 1861-1865, with Commanders, Strengths, Losses and More"
F. Ray Sibley and Joseph Crute have published order of battle data for the Army of Northern Virginia, but (as far as I know) Darrell Collins's The Army of the Potomac: Order of Battle, 1861-1865, with Commanders, Strengths, Losses and More is the first attempt at a comprehensive OB study for the primary Civil War army of the United States. In this book, Collins compiles organizational data for all the main campaigns [First Bull Run, The Peninsula, Second Bull Run, Maryland Campaign, Fredericksburg, Chancellorsville, Gettysburg, Bristoe, Mine Run, Overland Campaign, 1864 Shenandoah Campaign, Petersburg, and Appomattox] and Ball's Bluff, also composing a brief narrative introduction for each. Like the typical order of battle one finds in Civil War campaign histories, Collins arranges the entire army unit and command structure in cascading fashion: army --> corps (if applicable) --> division --> brigade --> individual regiments and batteries. The officer in charge of each unit, as well his casualty status and replacement, is named when the information is available. The muster in date for all the regiments is provided, as are casualty numbers broken down into killed, wounded, and missing; loss totals; and percentage lost when numbers present are known. At the end of each order of battle is a number and loss summary at division or corps scales, and a list of the ten regiments with the highest casualties suffered over the course of the battle or campaign. The information is all organized in an easy to read and comprehend tabular format. The sole source used to create the orders of battle is the Official Records, with use of Dyer's Compendium for muster-in dates and Heitman's Historical Register for officer first names. Across the board consistency presumably has something to do with this choice, but the author's own explanation for limiting his sources is that all figures represent estimates and the modern reexaminations and reformulations have controversies of their own on some level. It is true that the OR OBs have generally stood the test of time, and the majority of battle and campaign history authors simply copy them into their works with little or no critical contribution of their own, but there are errors and omissions in the OR and it is unfortunate that so many blank spaces in Collins's compilation exist when well researched and well respected references are available to fill them [for instance, the Gettysburg battle has more than one exhaustive number and loss study in print]. Given the content claims of the book's subtitle, many readers will be disappointed to find so few strength figures, especially at the regimental level. Present for duty numbers are consistently available only at brigade level and above. This scarcity of data is in contrast with artillery battery compositions, which all have numbers of guns and tube types listed (there is even occasional trivia added like 'total rounds fired'). But even this seemingly more thorough OB representation has problems of identification. For instance, Collins lists the 12-pounders present in batteries without differentiating between the 12-lb howitzer and the Napoleon. It is true the Union army, especially in the East, retired the outdated howitzers from their field batteries quicker and more thoroughly than their Confederate counterparts, but it would have been helpful to have definitive IDs. 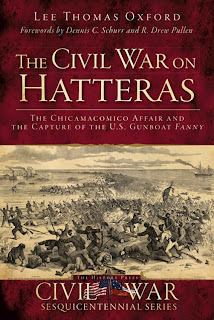 Oxford: "THE CIVIL WAR ON HATTERAS: The Chicamacomico Affair and the Capture of the U.S. Gunboat Fanny"
Students of the Civil War in eastern North Carolina have been blessed with a consistent stream of excellent scholarship, among the best examples are campaign histories by Richard Sauers (the Burnside Expedition) and Paul Branch (Fort Macon), Judkin Browning's social historical assessment of the Union occupation, and community studies by Barton Myers (Pasquotank County), Gerald Thomas (Bertie County), and Christopher Meekins (Elizabeth City)1. 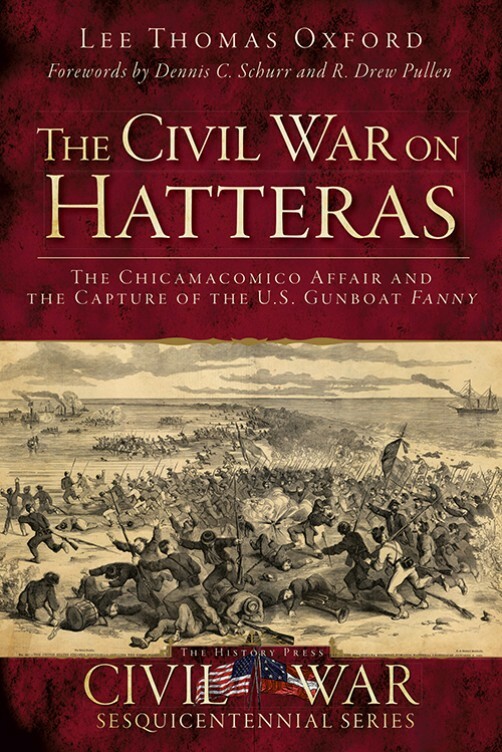 However, this exemplary body of literature typically begins with the 1862 Burnside Expedition, only lightly passing over events from 1861, which includes Benjamin Butler and Silas Stringham's successful joint operation against Hatteras Inlet and the following pair of events discussed in Lee Thomas Oxford's The Civil War on Hatteras: The Chicamacomico Affair and the Capture of the U.S. Gunboat Fanny. After his capture of Forts Clark and Hatteras on August 29, Butler returned to Fort Monroe, leaving a small garrison behind under the overall command of the 9th New York's Colonel Rush C. Hawkins. Hawkins, who, according to Oxford, was very solicitous of the welfare of the island's Unionist populace, sent the newly arrived 20th Indiana 40 miles north to Camp Live Oak near Loggerhead Inlet, securing the entire barrier island between that place and Hatteras Inlet. The Confederates were not content to allow this movement to pass unopposed, however, and launched a combined operation of their own. On October 1, a CSN squadron captured the USS Fanny, which was ferrying supplies and reinforcements to the 20th Indiana's camp. On October 4, this was followed by a planned three-pronged amphibious landing (only two actually hit the beaches) by parts of three Confederate regiments from Roanoke Island under the overall direction of Colonel Ambrose R. Wright of the 3rd Georgia. Although Wright failed to force the 20th to surrender en masse, a total of 73 men were captured on the Fanny and during the 20th's long October 4-5 retreat to Hatteras Lighthouse (which became known as the Chicamacomico Affair, named after a town near Camp Live Oak). Hawkins's insubordinate and unconvincing self-justifications aside, author Oxford makes a strong case that the lion's share of the blame for Chicamacomico should rest on the colonel's shoulders. Hawkins's ordering of the 20th to an unsupported position without securing the full cooperation of the navy was reckless. On the other hand, some amount of responsibility belonged with the navy, which, despite its disingenuous protestations that the Fanny was an army vessel, was caught unprepared during a command transition. Similarly, the army's high command, even though it sent a stream of general officers to Hatteras to relieve Butler [first John F. Reynolds (who didn't even make it there before being recalled), then Joseph K. Mansfield and Thomas Williams], dropped the ball, managing to have no officer of that rank actually present and in charge at the time of the events in question. Oxford also argues that the events in his book deserve more recognition because they represent a pair of Civil War "firsts". According to the author, the capture of the Fanny marked the first instance of an armed U.S. warship being lost to Confederate forces in combat during the Civil War. Additionally, the amphibious landings on Hatteras were the first of their kind on the Confederate side2. In documenting such comparatively small scale military events, Oxford's narrative is unusually lengthy and densely detailed, the accompanying notes and bibliography indicative of a highly diligent search and discovery of available source materials. The degree of scholarship is impressive, with depth surpassing that found in most local histories. In his quest to learn more about his 20th Indiana ancestor's service, Oxford has also uncovered a wealth of material on the regiment's officers and men. This is presented in both the main text and in the appendices. Future 20th Indiana regimental historians will surely want to pick up a copy of this volume on those grounds alone. The book also contains a fine collection of photographs and newspaper lithographs. The maps, which superimpose atop 1852 Coastal Survey maps the relative positions and movements of the various contending ships and land units, are fine representations of the actions described in the text. The Civil War On Hatteras really does everything quite well. In addition to being one of the best Civil War Sesquicentennial series volumes to date, the book ranks among the finest available histories of coastal North Carolina Civil War military campaigns and events. * A Succession of Honorable Victories: The Burnside Expedition in North Carolina by Richard Sauers (Morningside, 1996). * The Siege of Fort Macon by Paul Branch, Jr. (Griffin and Tilghman, 2002 revised and expanded ed.). * Divided Allegiances: Bertie County during the Civil War by Gerald W. Thomas (North Carolina Division of Archives and History, 1996). * Executing Daniel Bright: Race, Loyalty, and Guerrilla Violence in a Coastal Carolina Community 1861-1865 by Barton A. Myers (Louisiana State University Press, 2009). * Elizabeth City, North Carolina and the Civil War: A History of Battle and Occupation by Alex Christopher Meekins (The History Press, 2007). 2 - These kinds of claims often rest on debatable issues of scale and definition, but both appear to be good candidates. The Confederate amphibious landing and assault on Santa Rosa Island occurred a few days later on October 9, 1861, and I can't really think of any other Confederate amphibious operation of similar scale. Earlier operations, like the capture of Ship Island and Fort Massachusetts in the Gulf, were basically unopposed. As for the Fanny (which may or may not have been put in formal commission by the navy), I can't think offhand of something that could definitively overturn the claim. I believe some armed revenue cutters were captured earlier by state or Confederate forces, but those were Treasury Department vessels and did not belong to the USN. I've had favorable experiences with books from Angle Valley Press so news, infrequent as it is, regarding pending releases from this micro publisher arouses my attention. 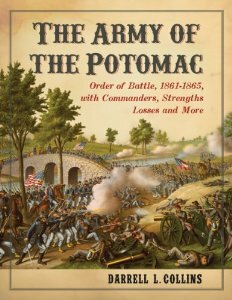 On September 17, John Fox's Stuart's Finest Hour: The Ride Around McClellan, June 1862 will be available. Next year, we can expect The Three Battles of Winchester by Brandon Beck and Confederate Dead from Gettysburg by Robert K. Krick and Chris Ferguson. 1. Greyhound Commander: Confederate General John G. Walker's History of the Civil War West of the Mississippi by John G. Walker, edited by Richard Lowe (LSU Pr, 2013). Author of an excellent history of Walker's Texas Division, Lowe is uniquely qualified to introduce and annotate Walker's own history of the CW in the Trans-Mississippi, penned soon after the war's conclusion while the ex-Confederate was in exile in London. 2. Union Heartland: The Midwestern Home Front during the Civil War edited by Ginette Aley and J.L. Anderson (Southern Illinois UP, 2013). This is a collection of seven home front themed essays (plus an introduction). Subjects include examinations of wartime farm life in various places, a study of the agricultural might of the Midwest, civilian interactions with Confederate POWs in Ohio, university student patriotism in Michigan, and soldier wives in Indiana. 3. Horses and Mules in the Civil War: A Complete History with a Roster of More Than 700 War Horses by Gene C. Armistead (McFarland, 2013). "Using firsthand accounts, the many uses of equines during the war, the methods by which they were obtained, their costs, their suffering on the battlefields and roads, their consumption by soldiers, and racing, mounted music and other themes are all addressed". 4. Constitutionalism in the Approach and Aftermath of the Civil War edited by Paul D. Moreno and Johnathan O'Neill (Fordham UP, 2013). The authors of the nine essays in this volume "examine key constitutional developments leading up to the War, the crucial role of Abraham Lincoln's statesmanship, and how the constitutional aspects of the War and Reconstruction endured in the late 19th and early 20th centuries". Topics range "from George Washington's conception of the Union and his fears for its future to Martin Van Buren's state-centered, anti-secessionist federalism; from Lincoln's approach to citizenship for African-Americans to Woodrow Wilson's attempt to appropriate Lincoln for the goals of Progressivism. Each essay zeroes in on the constitutional causes or consequences of the War, and emphasizes how constitutional principles shape political activity". 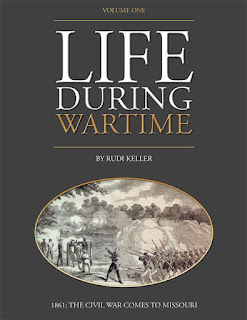 Keller: "LIFE DURING WARTIME - 1861: The Civil War Comes to Missouri"
Life During Wartime is a planned series of hardcover volumes compiling Columbia Daily Tribune journalist Rudi Keller's 150 Years Ago columns. 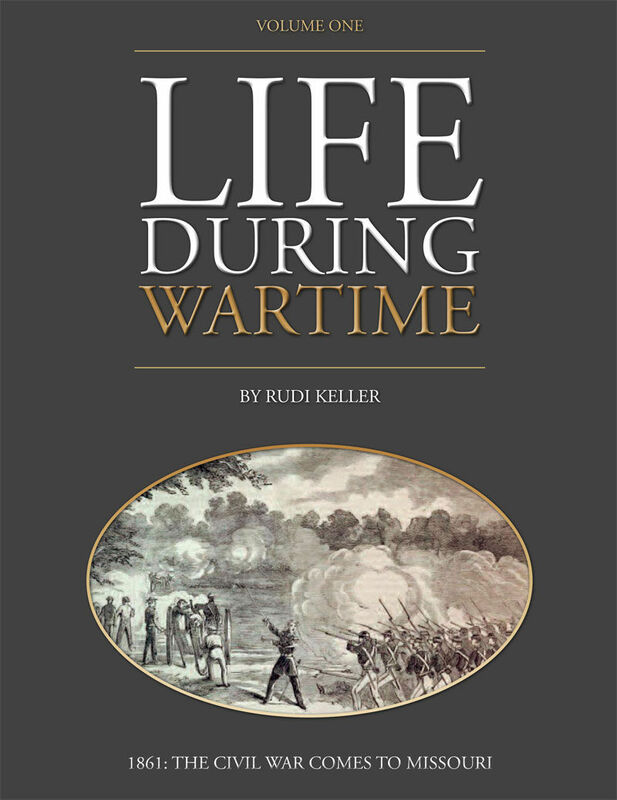 Keller's goal is to provide a daily record of nearby Civil War military, political, and home front anecdotes and events for his newspaper's readers. His region of concern covers roughly eight counties [Audrain, Boone, Callaway, Cole, Cooper, Howard, Moniteau, and Randolph] straddling the Missouri River in the central part of the state. Beyond obvious reasons of local interest, Columbia being in Boone County, the chosen geographical area should be of broader interest as it illustrates well the state's ideological and economic divide, with secession sympathizers, conservative Unionists, and radicals all in significant numbers within the state's slaveholding Boonslick region. With Jefferson City located in Cole County, the political machinations of the capital city are also presented at some length. Daily entries generally consist of a handful of events from several locations. Outside influences from places like St. Louis to the east are also included to provide necessary context for incidents occurring inside the eight-country area. The text is not annotated, and the source list that accompanies each online column is not reproduced in the hardcover compilation for reasons of space, but a bibliography is included. Research materials include newspapers, books, articles, online resources, and manuscript collections, enough to suggest that the effort involved was substantial. Given that Nathaniel Lyon's small army swept through "Little Dixie" during the first year of the war, it should come as no surprise that military events comprise a large part of Volume 1 [1861: The Civil War Comes to Missouri]. 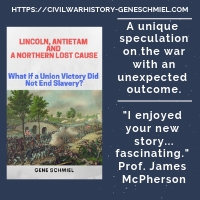 An advantage of remaining within a defined geographical area is that incidents and skirmishes passed over by other published studies, which generally leave the region following the Battle of Boonville, can be given full attention. After Boonville, Keller recounts threats to shipping and almost daily guerrilla attacks upon the North Missouri Railroad, the only one spanning the entire state from east to west and thus a critically important transportation asset. He also describes Fremont's military build up in central Missouri, preparatory to evicting the Missouri State Guard from the state after that army's Lexington victory. 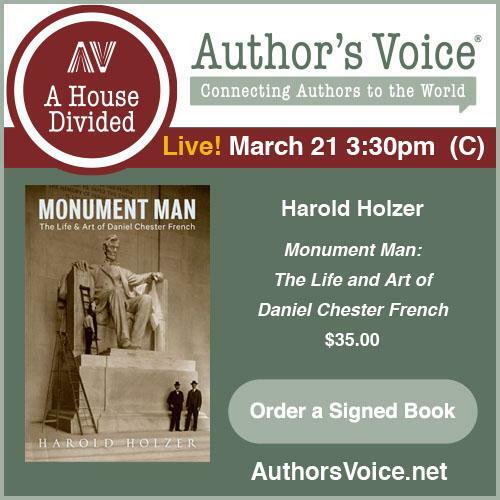 Of additional interest is the book's tracing of U.S. Grant's early Civil War military career. Finally, John Pope's struggle to keep the North Missouri Railroad in running order in the face of incessant attack and sabotage, his solution being the U.S. military's earliest comprehensive anti-guerrilla policy, is highlighted. Keller's writings also provide a useful daily record of the political debates within the Missouri legislature, before, during, and after the shooting war began. Even though large numbers of secessionist sympathizers were present throughout the state (though concentrated within the slaveholding counties hugging the Missouri River in the central part of the state), Governor Claiborne Jackson utterly failed to foster a secession movement, the vast majority of the citizens ranging in sentiment from Conditional Unionists to Unconditional Unionists. Keller utilizes the newspaper columns of William Switzler as representative of the views of conservative Unionists. In the minds of national authorities and more radical Missourians, these pro-slavery Unionists, who generally opposed the policies of the Republican administration and its often heavy handed military occupation of Missouri, were always suspect in loyalty. In contrast, the views of pro-secessionist Missouri newspapers, when they could stay open, are also offered, as well as those of the far more radical pro-Union opinion makers in St. Louis. The entire kaleidoscope of attitudes and opinions is presented. The deposing of the elected government, and the creation of a new provisional state government led by conservative Unionist Hamilton Gamble, is also traced, with the oath of allegiance to the federal government a new requirement to hold office. Although military and political topics dominate, home front issues are not entirely neglected. Keller also correctly notes that the war's first shots started slavery down the path to extinction in the state, with practical emancipation taking precedence over official policy almost from day one. The book itself is solidly constructed in textbook binding format and well illustrated with photographs and period drawings; however, more maps were needed, especially one detailing all the geographical points of interest in the eight-county region. Editing could also have been improved, from fixing the occasional typographical error to eliminating the repetition of material from one entry to the next. For example, frequent background information repetition and reintroduction of important figures may have been helpful in the daily online format, but book readers perusing weeks of material in a single sitting will find the practice extremely tedious. Presentation niggles aside, the Life During Wartime project promises to be a very functional Civil War Day-by-Day record for Central Missouri, a region often ignored in the general literature between the passage of Lyon early in 1861 and the entrance of Sterling Price's raiding force in the fall of 1864. One hopes that Volume I will be successful enough for the rest of the yearly compilations to be published.